Drill out the hole using a Micro-Drill System and ball mill. 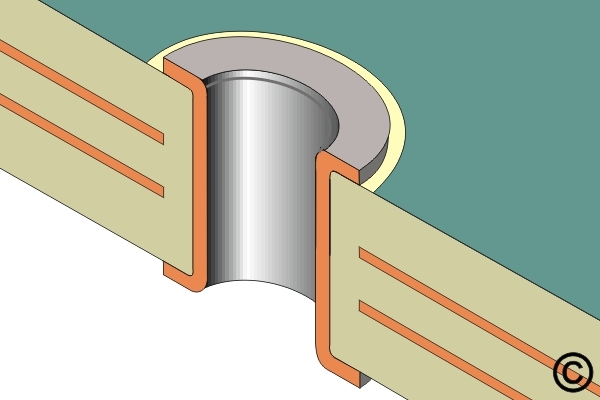 The eyelet flange can be used to secure a new circuit in place. Set the eyelet using an Eyelet Press. This procedure covers the repair of a damaged hole that has no inner layer connection. An eyelet is used to repair the damage to the hole and the eyelet flanges replace the lands on the circuit board surface. This procedure is used only to restore the integrity of a through connection in a double sided board or a multilayer board where there is no inner layer connection. If there is an inner layer connection see appropriate procedure. 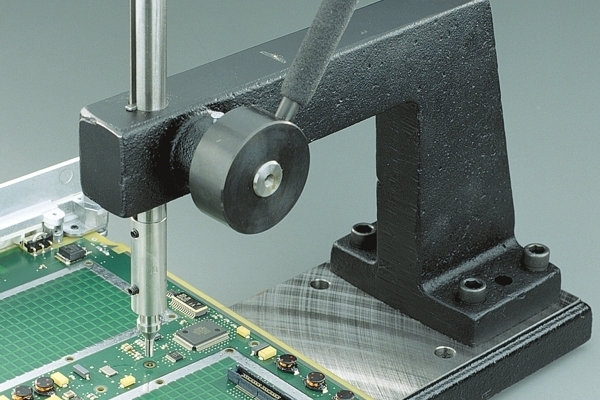 Heavy duty eyelet press designed to set and form eyelets in circuit boards. A must-have tool for precise cutting, scraping and trimming. 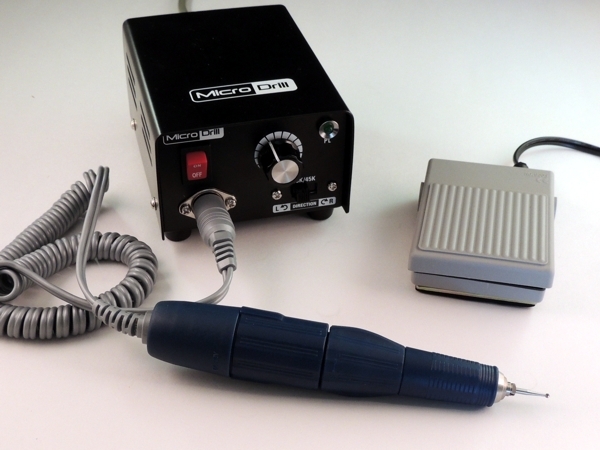 Versatile power tool for milling, drilling, grinding, cutting and sanding circuit boards. 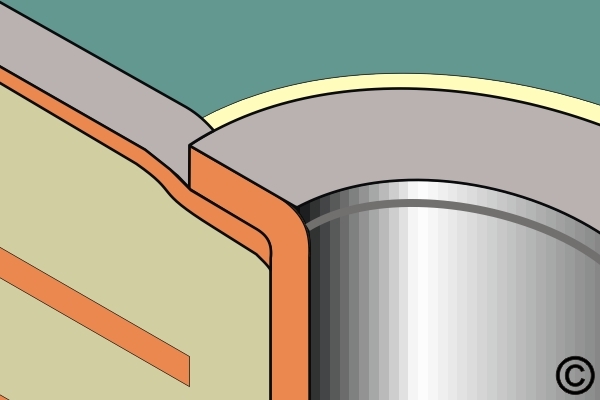 Figure 1: Drill out the hole using a Micro-Drill System and ball mill. 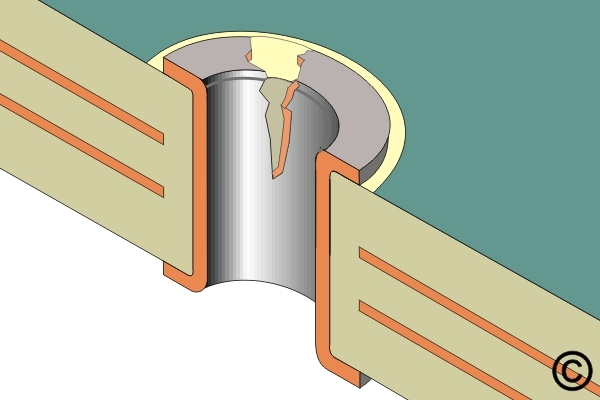 Figure 2: The eyelet flange can be used to secure a new circuit in place. Figure 3: Set the eyelet using an Eyelet Press. The eyelet inside diameter should be a .075 - .500 mm (.003"-.020") greater than the component lead diameter. The length of the eyelet barrel under the flange should be .630 - .890 mm (.025" - 035") greater than the thickness of the circuit board. This added length allows for proper protrusion when setting the eyelet. The eyelet flange diameter should be small enough to prevent interference with adjacent lands or circuits. The clearance hole drilled through the circuit board should allow the eyelet to be inserted without force but should not exceed .125 mm (.005") greater than the eyelet outside diameter. Be sure to select an eyelet meeting the proper criteria. An eyelet with an oversize flange may interfere with adjacent circuits. An eyelet that is too short will not protrude through the circuit board for proper setting. Select an eyelet using the Eyelet Selection Criteria. Use a pin gauge and caliper to measure the existing plated hole dimensions. This procedure may isolate internal connections on multilayer circuit boards. Apply a small amount of liquid flux to the land or circuit on the circuit board surface, if any, and tin with solder using a soldering iron and solder. Clean the area. Turn the circuit board over and rest the eyelet flange on the lower setting tool. Apply firm even pressure to form the eyelet barrel. Inspect the eyelet flange for evidence of damage. Refer to IPC-A-610 Acceptability of Electronic Assemblies. Apply a small amount of liquid flux and solder the eyelet flanges to the lands on the circuit board surface if necessary. Clean the area. 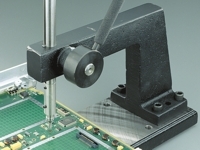 Inspect for good solder flow and wetting around the eyelet flanges and lands. Visual examination, dimensional requirement of land diameter and inside diameter. 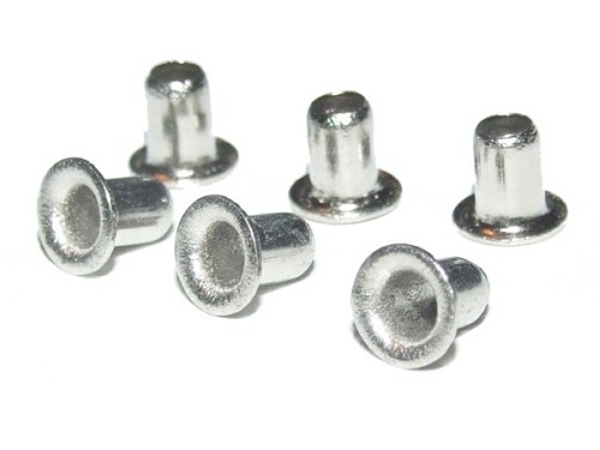 Kit to repair damaged plated holes on circuit boards using eyelets. Eyelets are brass or copper, electroplated with tin unless otherwise specified. "We're operating on a tight production schedule, with no time to waste. Circuit Technology Center has consistently delivered our boards back to us on time, and sometimes even ahead of schedule. This has helped us stick to deadlines. Thanks to their fast turnaround." Do Your Repair Techs Deserve One? 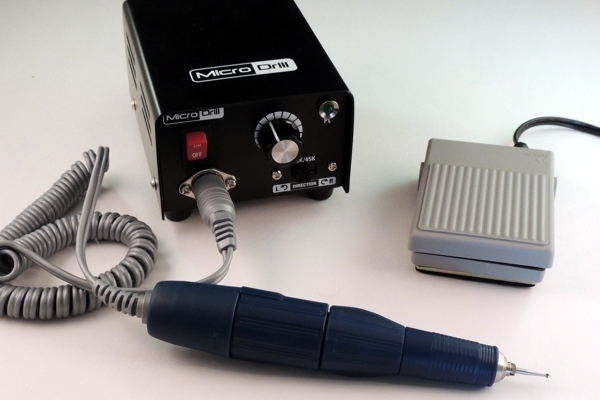 The Micro-Drill is the ideal tool for precision drilling, grinding and cutting on circuit boards. 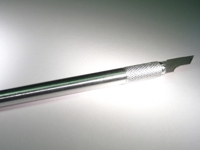 Use it to remove coatings, cuts circuits, drills holes, and much more. No matter how much we attempt to streamline and automate the process, BGA Rework has been, and will likely always be, a mixture of art and science. 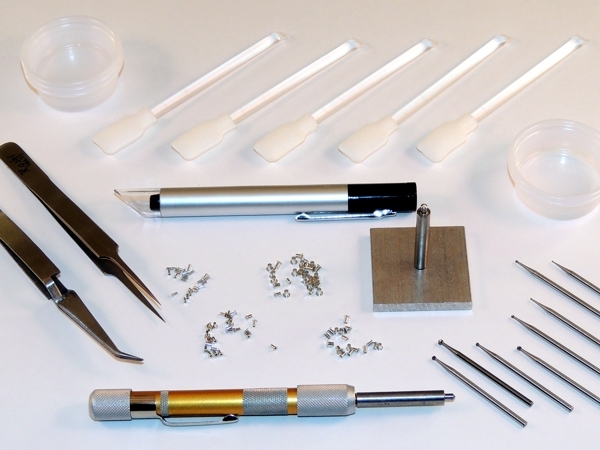 These kits have been used for decades by the most demanding electronics manufacturers. Every item is thoroughly field tested. What happens to your valuable circuit boards when they're damaged? Can they be repaired reliably and cost-effectively? Yes, if you have the skills and knowhow.